Gabrielle Bonheur Chanel was born in August 19, 1883 in Saumur, France. She was a pioneering French couturier whose modernist philosophy, menswear-inspired fashions, and pursuit of expensive simplicity made her arguably the most important figure in the history of 20th-century fashion design. When she was 12, her mother died and her father, who was a travelling wine peddler, left her and her sister in a convent and disappeared forever. The convent was sad experiences for 6 years, for poor girls kept apart from the paying girls, wore a different uniform and were looked down on. A friend said much later that Coco was trying to put all the world's women into the uniform she wore then, a black dress with white collar. At 18 she left the convent and worked in a tailoring shop but she aspired to be a music hall performer and tried singing for a while. Balsan’s home was a magnet for his numerous hunting friends and their fashionable mistresses. After a couple affairs with generous wealthy men – a military officer and later a English Industiralist – she was able to open a shop in Paris in 1909, selling ladies simply decorated hats from Balsan’s ground floor Paris apartment. Arthur “boy” Capel was a member of Balsan’s circle, and he was the only one who worked for a living. Chanel became infatuated with him. As a businessman, he recognized a potential business- woman in Chanel and in 1910, set her up in a small shop on the Rue Cambon in Paris. Her influence on haute couture was such that she was the only person in the field to be named on the List of TIME Magazine’s 100 most influential people of the 20th century. Since there was already a couture shop in the building, her lease forbade her to also make couture dresses. In 1911 and 1912, rich ladies came to Deauville and Biarritz, the resort towns, for the races and the women vied to out do each other with frills, flounces, huge hats, tight corsets, long skirts and everything that Chanel detested. In 1913 she and Capel set up shops of her. Little did they all know that within a year Deauville would be within earshot of the guns on the front lines of World War I, which would change this "belle epoch" and it's fashions forever. Chanel was going to be part of a fashion revolution, not just in the radical simplicity of her style but even in the materials she used to achieve it and particularly the accessories she used. During the War years, she moved into a larger shop on rue Cambon, across from the Ritz hotel. She started selling flannel blazers, straight linen skirts, sailor tops, long jersey sweaters and skirt-jacket Her suits even before 1920, had above-the-ankle skirts, three-quarter length coats loosely belted to reveal blouses that matched the jacket lining. Harpers Bazaar started mentioning her in 1915 and by 1917 said that "Chanel's” name is on the lips of every buyer. In her salon at 31 rue Cambon, she piled cushions of feathers, fur and metallic fabrics on the sofas in the gray and amber salons and showed increasingly simple day dress-and-coat ensembles, often in "biscuit" jersey (later called beige) as well as black evening dresses in lace or jet-embroidered tulle. During the Twenties, Chanel really established herself as the Queen of Fashion. Like most couturiers of the Twenties, Chanel designed beaded dresses, and of course, hers were different. 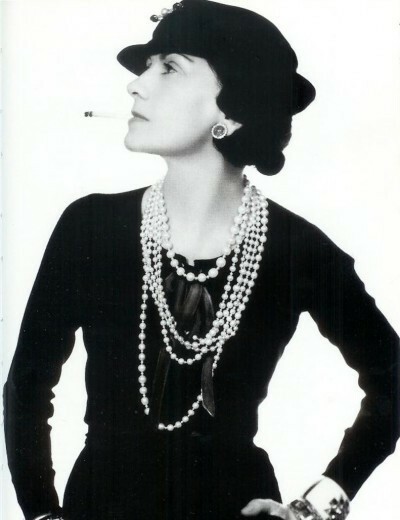 Chanel introduced her first costume jewellery in 1924 (a pair of pearl earrings, one black, one white) and she now began to elaborate this vision. Chanel's early-Twenties Russian look has been attributed to her liaison with Russian Grand Duke Dmitri. Chanel's most famous design - instantly recognized in it's hundreds of variations - is the suit in two or three pieces. First made around 1920 it is still popular today. No less a Chanel trademark is the "little black dress" which she was advocating as the new uniform for afternoon and evening as far back as 1915. As her business grew, so did Chanel's social desirability and her personal legend. Her success and her fortune were her entree and she manipulated them brilliantly. She now had a new lover the Duke of Westminster. Chanel No. 5-5 was Coco Chanel's lucky number. In 1921 when Earnest Beaux created a new perfume for Gabrielle Chanel, she used her lucky number. This was the perfume that would make her fortune. Her trade-mark simplicity was expressed in the shape of the bottle, a design which has never been altered and helps to make it the world's largest selling perfume. During the Twenties, Chanel really established herself as the Queen of Fashion. Two of her most famous creations are Chanel No. 5 perfume, launched in 1923, and the influential Chanel suit, an elegant suit comprised of a knee-length skirt and trim, boxy jacket, traditionally made of woven wool with black trim and gold buttons and worn with large costume-pearl necklaces. In 1924 Chanel introduced her first costume jewellery (a pair of pearl earrings, one black, one white) and she now began to elaborate this vision. She also popularized the little black dress, whose blank-slate versatility allowed it to be worn for day and evening, depending on how it was accessorized. Although unassuming black dresses existed before Chanel, the ones she designed were considered that haute couture standard. In 1923, she told Harper’s Bazaar that “simplicity is the keynote of all true elegance”. With the arrival of the Thirties, Chanel's evening clothes became more elongated, more feminine and by the end of the decade, almost fantastical. For summer evening dresses, she surprised with contrasting scintillating touches like rhinestone straps or silver eyelets. In 1937, struck by how small women looked when seated at the theatre, she showed a collection of head dresses designed to lend height; confections of tulle, silk flowers and the increasingly evident Chanel ribbon bow. A competitive situation developed in the thirties between Chanel and Elsa Schiaparelli, whom Chanel referred to as "that Italian artist who makes clothes". Schiaparelli's influence was only limited to the one decade but for this short time, she was the more sensational. This did not however force Chanel into trying to do the same thing. Her style was faultlessly elegant, modern and matchlessly chic. The Chanel style of elegance with a foundation of comfort, ease and practicality, continued throughout the thirties. In 1939 when World War II began, Chanel closed her salon and took up residence at the Ritz Hotel. From June 1940 the Nazi High Command had made the Ritz Hotel their headquarters so a rumour spread throughout Paris that Chanel was on more than friendly terms with the Germans. When Paris was liberated in 1945 the French took revenge on women who had collaborated with the Germans. However within a week of the liberation of Paris she left for Switzerland and she remained there until 1953. By 1953 Paris had forgotten Chanel. 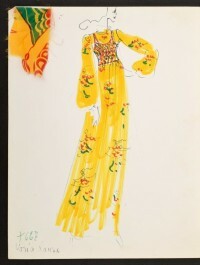 Dior's "new look" had everyone excited in 1947 and there were many new and successful designers in Paris. However Chanel, goaded primarily by the boredom of retirement and a decline in perfume sales, displayed here usual sense of perfect timing. The impact of the "new look" was waning and the stage was set for a return to elegant chic. At the age of 71 she prepared her new collection in her old salon on the rue Cambon. In 1957 she introduced her chain handled quilted leather handbags which have gone on to be so successful. She died on January 10th 1971 at the age of 88 still in harness, still designing, still working. After her death, the house of Chanel was looked after by Yvonne Dudel, Jean Cazaubon and Phlippe Guibourge. The Chanel suit and the Little Black Dress were sold in their usual vast quantities, and all the Chanel products sold very well, but the sparkle had gone. Pierre Wetheimer who had manufactured No. 5 for Coco Chanel, had bought the house. His grandson Alain Wertheimer, took over in 1974 when he was 25 years old. He spent a few years trying to restore Chanel's prestige and sought a new designer for the house. Chanel needed someone to put life back into the veritable house. 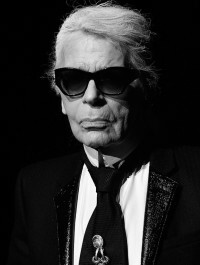 The owner Alain Wertheimer persuaded Karl Lagerfeld to sever his contract with Chloe and become Chanel's chief designer for an annual salary of $ 1 million. In 1983 Karl Lagerfeld took over Chanel. Chanel is one of today’s best known and highly sought-after fashion brands, and has been practically since it was founded by Coco (Gabrielle) Chanel in 1909. The luxury brand stands out in just about every category—couture, ready-to-wear, accessories, jewellery, shoes, and fragrances. Although Chanel borrowed many details from men's wear, her suits were never imitating men. Usually soft and untailored, made in jersey, velvet, silk charmeuse or tweed, these suits share the practical constants of boxy cardigan jackets with sleeve buttons that really button up, pockets where one needs pockets and straight knee-length skirts with walking pleats. Chanel disapproved of suits that could be worn only with the jacket closed so she designed jackets that looked good open, closed or draped over a shoulder. She made blouses which were an integral part of the ensemble, using fabrics matching the suit's lining, printed in corresponding colours or made in school-girl white with immaculate collar and cuffs. Women are dependent on this look even today. Chanel’s “little black dress” was Deceptively simple, these dresses were wizardry's of cut and proportion. She used traditional elegant materials lace, tulle, embroideries, soft weightless silks - in a newly tailored way. Worn with a cardigan of the same fabric as the suit on the next hanger, the little black dress made women wearing anything else seem overdressed. Everyone who’s anyone. Seventies Chanel No. 5 spokesmodel Catherine Deneuve, current Chanel No. 5 spokesmodel Nicole Kidman, Natalie Portman, Jennifer Aniston, and Scarlett Johansson, and lots of Park Avenue ladies. Kirsten Dunst, Vanessa Paradis, Nicole Kidman.